Applesauce Poop is seriously, egregiously, incomprehensibly gross. It is worse than Breastmilk Poop. It is worse than Soy Formula Poop. It is worse than Nuclear Fallout Radiation Poop. Applesauce Poop is the most horrendous poop of all. 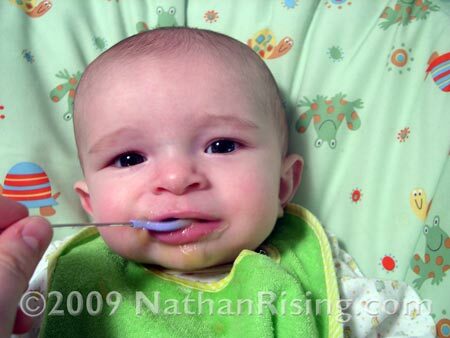 I thought Nathan had the King of All Poops (the poop that rivaled all other poops in the galaxy… unaware that the Poop of the UNIVERSE would soon follow) when we started supplementing with soy formula…. I had no idea. Smelling the results of applesauce consumption was the furthest thing from my mind when we were feeding Nathan his first solid food, but now that I have experienced the results of said applesauce consumption, I have decided that solid foods make stinky babies. Like a troll smell. I’ve never smelled a troll, but I would imagine their stench to somewhat of a mixture of rotten garbage, soggy potato chips, and decomposing carcasses with a hint of a sulfuric gasses. That’s what baby Applesauce Poop smelled like. It totally outdid the pond scum smell.